Last Sunday marked 16 months off treatment for Sam and after six months of physio. He is finally strong enough to play football for a local team. It’s always been his dream, to be able to join in and play matches and it’s finally coming true. He even scored in his first match. To see the look on his face, when he scored. I will never forget that moment. Sam finished chemotherapy on 11 April 2017. We were very lucky to celebrate our first day off treatment at Weston Super Mare Grand Day Out, a welfare event organised by Children with Cancer UK. We had a wonderful day on the pier celebrating, going on the rides, eating fish and chips. Sam is thriving off treatment. It took a couple of months for his strength to return and he had a troubled time with a few side effects. A long summer holiday break and a trip to France to see our friends really helped. His hair is really thickening up and he’s started to grow, which he’s very happy about. One of the highlights over recent months was filming a video for Children with Cancer UK. It was a little translator video to help explain new cancer treatments. The boys loved being in front of the camera and it felt great to be able to help, after all the support the charity has given us. 11 September will mark five months off treatment and I am grateful for every one of those days. Cancer has taught our family to make the most of life. In the weeks leading up to his diagnosis, Sam had been unusually tired. He was asking to drive places, rather than walk. He had also been struggling in his swimming lessons and was complaining of a sore neck. The doctor initially thought Sam had a trapped nerve in his neck and suggested pain killers. A week later Sam woke up screaming and crying because his hip hurt. This time the doctor suggested referring Sam for physiotherapy. At that stage it seemed a logical thing to do. That night the pain still had not gone so I took him to A&E. The doctors examined him but couldn’t find anything wrong. They sent us home with more pain killers and saying we should wait for the physio appointment. Two more days of awful pain and I took him to see a private physio. Fortunately she could tell that Sam’s pain was not normal. Apparently it’s very unusual for children to get deep bone pain. She called the A&E department and asked them to see Sam again – and this time to do a blood test. That night we were admitted and they started lots more tests. 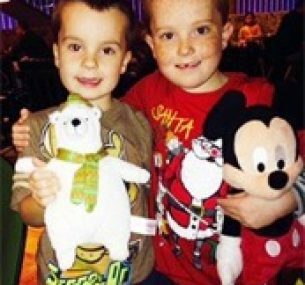 We had to wait 36 hours before being told that they suspected Sam had leukaemia. He needed to be transferred to another hospital for further tests. I was in complete shock. 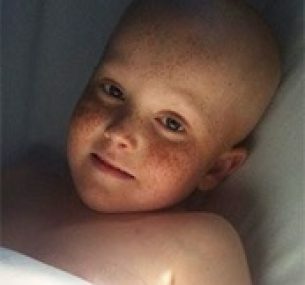 How could my otherwise healthy child have leukaemia? They are words that no parent wants to hear – and for those first few days I was in shock. At the specialist hospital Sam had a bone marrow test. This confirmed that he had acute lymphoblastic leukaemia (ALL). We stayed at the hospital for three weeks. Those days are a complete blur. I never thought that I would understand all of the words and medicines that the doctors used, or get used to the drugs that Sam has to have. We are so fortunate to be treated at such an amazing hospital and to have also met some wonderful families on this journey. We were also very lucky that Sam achieved remission quickly and that he has reacted well to the drugs. Further tests, however, showed that he had a high risk of relapse, so his treatment was intensified and lengthened. 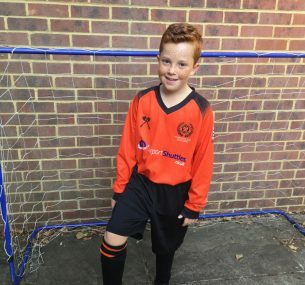 Sam’s treatment began in December 2013 and is due to last for three years and four months. Our end-of-treatment date isn’t until April 2017. At the moment that seems like a lifetime away. My husband and I are very lucky to have such supportive employers. I have been able to continue my job part-time. I can go to work once my husband gets home. Friends, family and our local community have also been hugely supportive. I never feel alone, there is always someone asking how we are, and if we need help. I do not know what the future holds for our family. Sam’s illness has made us live for the day. We find the five days a month when he has steroids very challenging, but his friends are very accepting, his friends’ parents very understanding and his school very accommodating. They know that it’s Sam’s chemo making him emotionally and physically less able and they all work together with us to help him cope. We are incredibly lucky and it has made his illness less isolating. Sam is now eight, and I could not be prouder of how he has dealt with everything life has thrown at him. We make the most of every day and try and fill our lives with as much joy and fun as possible. A while back Sam said: “Mummy, these may be the best three and a half years of my life”. He’s still saying that after two and a half years. So I feel, as a mum, that I am doing the best job that I can. Trying to make these years as fun as I can, so we have more happy memories than sad ones. The whole experience has certainly brought us closer as a family. And Sam and his brother, Ross, have developed a special bond too. Our Little Translators, Sam and Ross, help to explain Dr Kathleen Birley’s research. Immunotherapy is becoming an increasingly important tool in the treatment of cancer, and some early success has been achieved in certain childhood cancers.